When it comes to your stock, Simple Inked has your studio sorted. Provided that you initially set up your product quantities correctly, Simple Inked will keep your stock levels and product quantities accurate. Stock Ordering is for both your retail & studio use products, and it is so easy! First things first, you want to ensure that you have set up your product quantities. Head over to your Products tab in your Admin. Edit a product, and on the right side panel you need to set up your Min Qty, Max Qty and Quantity. Min Qty: The minimum requirement - when you drop below this number of products you need to re-order. Max Qty: The maximum requirement - when you re-order, this is the number of products you want on your shelf. Quantity: How many you have of this product right now. Once you have updated these sections, Save the changes. Do this for all of your products, then you are ready to use your Ordering. Now you are ready for some ordering. Ordering in your Simple Inked account. Head across to your Ordering section, which is located on your top menu bar. Once there, select New Order. In the order form choose the Supplier you wish to make the order for. 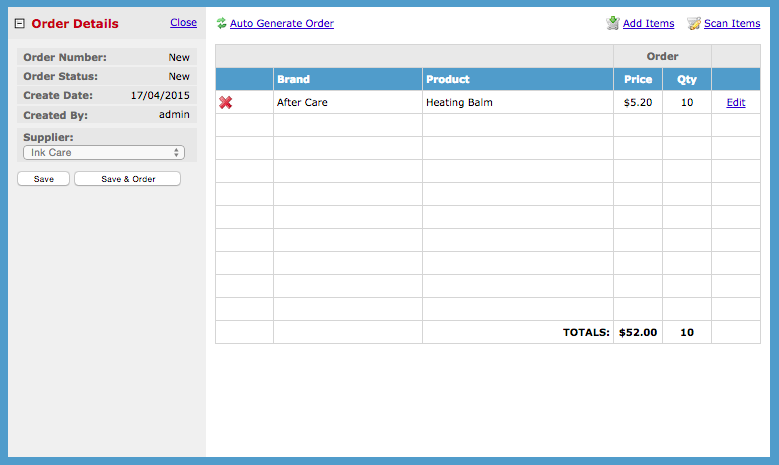 Then you will you have the option to Auto Generate Order. 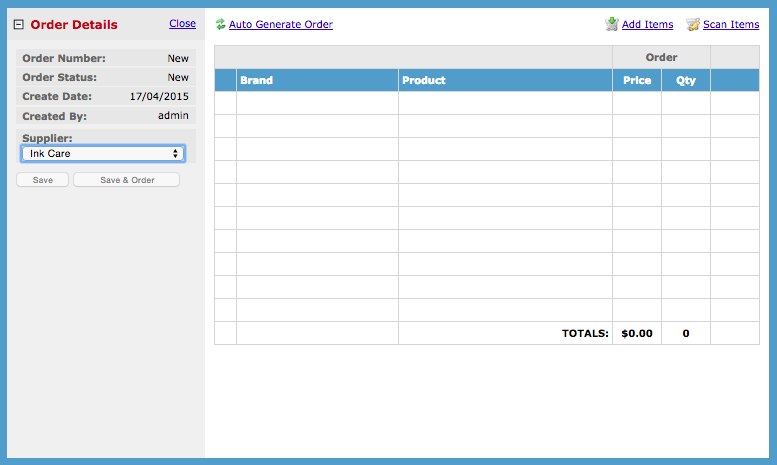 When you select the Auto Generate Order link, the system will automatically look for any products that have dropped below their Min Qty and automatically add these products to the order form. The system knows how many of that product to add to the order form based on the difference between the products Max Qty and Quantity. 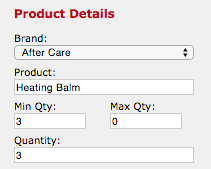 We have 0 Heating Balm products, therefore we need to order 10 to make our total 10. 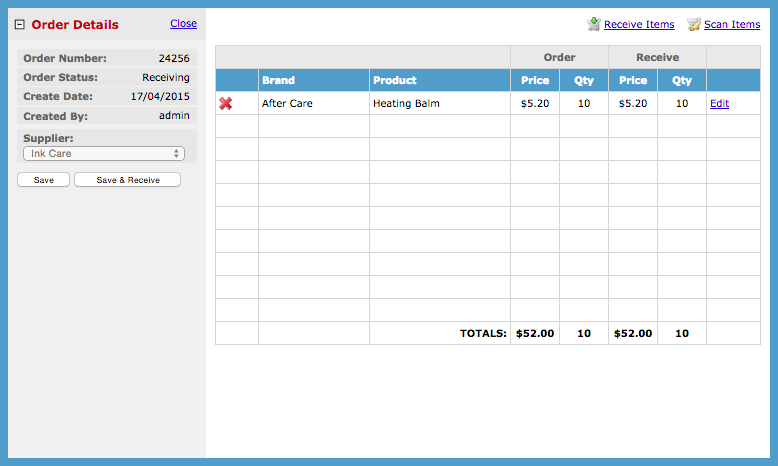 Here's what it looks like after we click Auto Generate Order for the Supplier of the Heating Balm. It does all the thinking for you. Of course, if you have other products for this Supplier, which have dropped below their Min Qty, they too will be added to the order form. You can also add items manually to the order by clicking the Add Items option, and selecting from the drop down menus on the right side panel the products you which to add to the order. Note: If you have a barcode system set up, you can also Scan Items and add them to the order form. When you have finished adding products to your order, if you'd like to, you can tick the Email order to supplier option and when you click Save & Order, the order will also be emailed to your supplier. 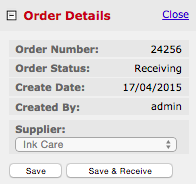 If you don't wish to email a copy of the order to your supplier, ignore the tick box and simply select Save & Order. That will save the order and you can View it here under Ordering. 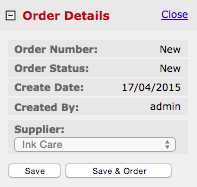 You will have the options of printing the order, duplicating the order or deleting the order via the picture icons. Note: The green light means that the order is ordered/not yet received and the red light means that the order has been received. When your products arrive at the studio, pop back into Ordering and click Receive. 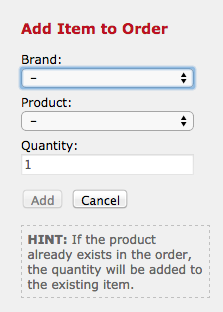 Check that you have received the right quantities and products, and make any necessary changes by clicking Edit. Note: If you have a scanner, you can also scan the products in one by one and the product will be added to the Receive column as it is scanned. Note: If you would like the Receive column to automatically apply the ordered amount, go into your Settings, then Ordering Settings and tick Populate Receive Column Automatically, and Save. Back to the order form, when you have updated all the Receive quantities and you're ready to save it, click the Save & Receive button. Click OK, if you are sure. You're done! Your product quantities will all be updated. Each time you sell a retail product, or use a Studio Use product, the product quantities will be deducted, until you need to re-order again. Simple!